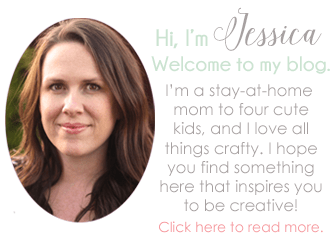 This is a sponsored post written on behalf of Cost Plus World Market. All opinions are my own. I’ve never been a big fan of buying gifts for Valentine’s Day. It always feels so forced. This year, I wanted to make a gift that would have a little more meaning behind it and celebrate the things I appreciate most about my family. 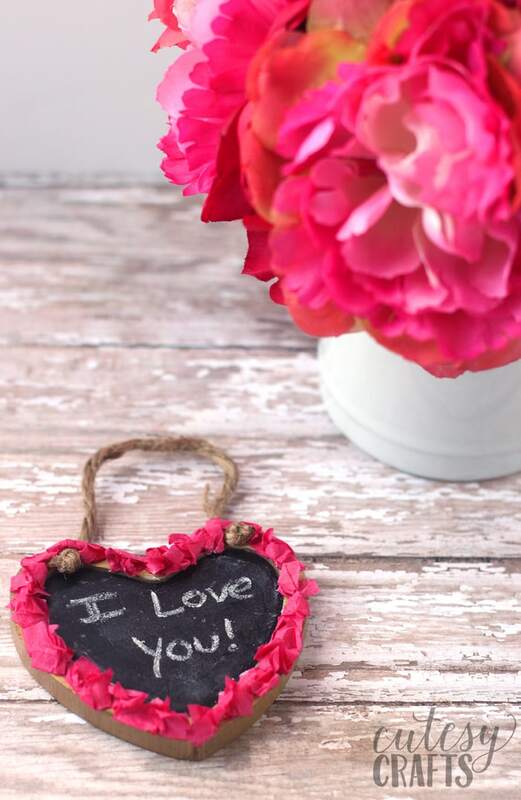 I used this idea to create a DIY Valentine’s Day gift that World Market featured at an event last week. I was so honored and excited that they chose to feature my craft, and I had a lot of fun at the event! 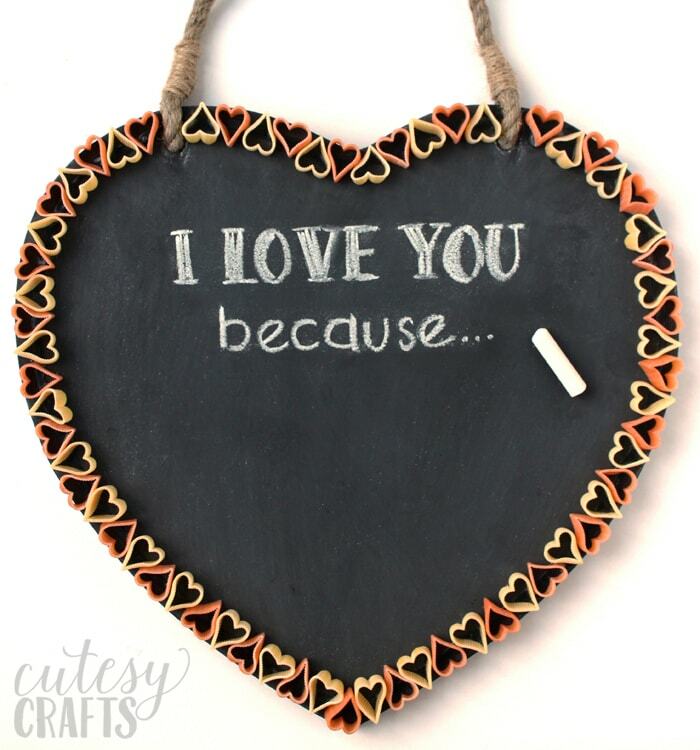 We made these “Things I Love About You” chalkboards to hang in the house for the days leading up to Valentine’s Day. You can write something that you love about your child or spouse on the board. It’s a really fun craft for kids or adults, and makes a great gift too. If you weren’t able to make it to the event, don’t worry. I’ve got a full tutorial for you today. 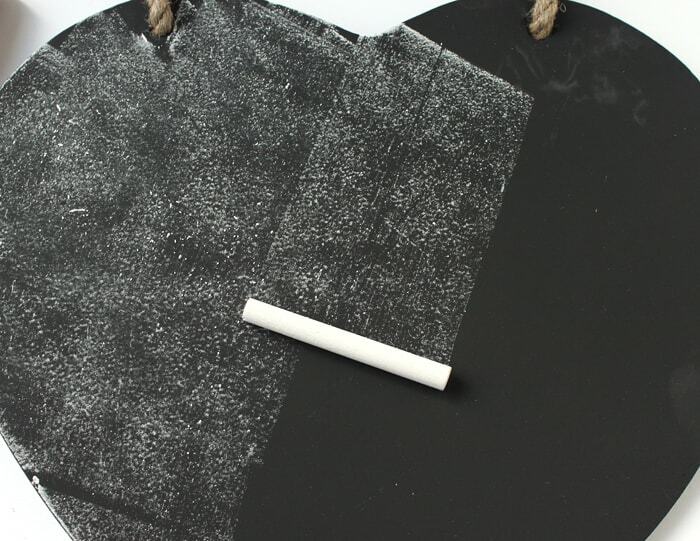 First, prime your chalkboard by rubbing the side of a piece of chalk all over the front and erasing with a paper towel. 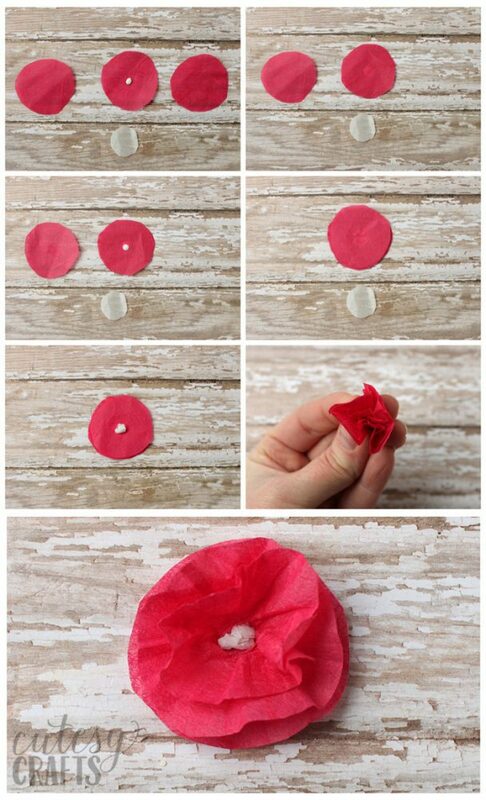 Next, make your tissue paper flowers. Cut three circles that are the same size, for each flower, out of the red, pink or light pink tissue paper. I have provided circle templates for size reference. The circles don’t need to be perfect, that makes them look more natural. Cut a small circle out of white tissue paper for the center. Put a small dot of glue on the center of one of the flower circles and place a second flower circle on top. Put another small dot of glue on top of that and place a third flower circle on top of that. Crumble the white circle into a ball and glue it in the center. Crumble each layer of the flower, up and towards the center. Pull each layer back down and adjust as needed. 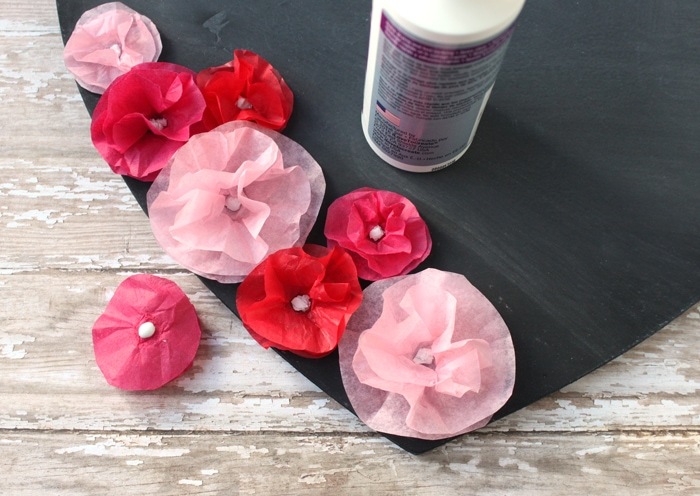 Put a single dot of glue on the back of each tissue paper flower and glue them around the chalkboard. Make sure to keep the center clear for writing. 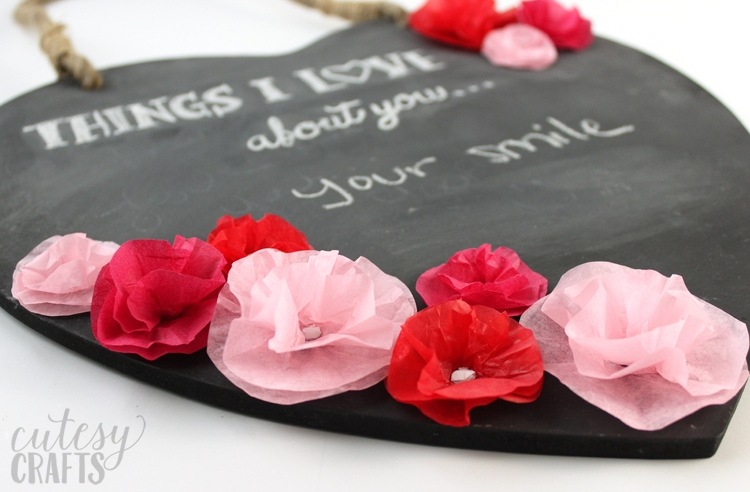 Once the glue is dry, write the first part of the message on your board; “Things I love about you…” or “I love you because…” You can use a white paint pen if you want to make that part permanent. 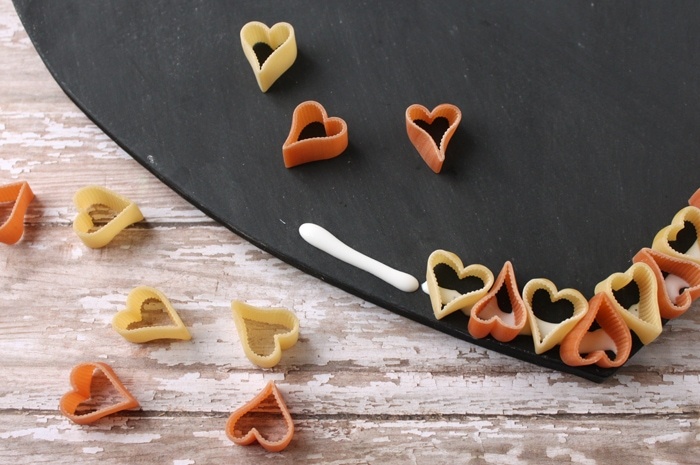 We also decorated boards with this adorable heart shaped valentine pasta. Seriously, you gotta get some of this stuff. I made the leftovers into part of our dinner, and the kids loved it! It will be on our Valentine’s Day menu for sure. 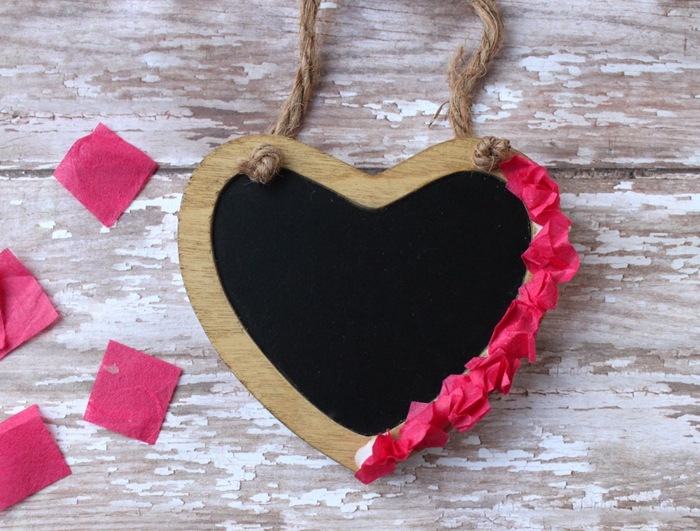 To decorate the chalkboard with the pasta, squeeze a thick bead of glue on the perimeter of the board and place the heart pasta on it to create a frame. Keep it flat, and the glue will dry clear. 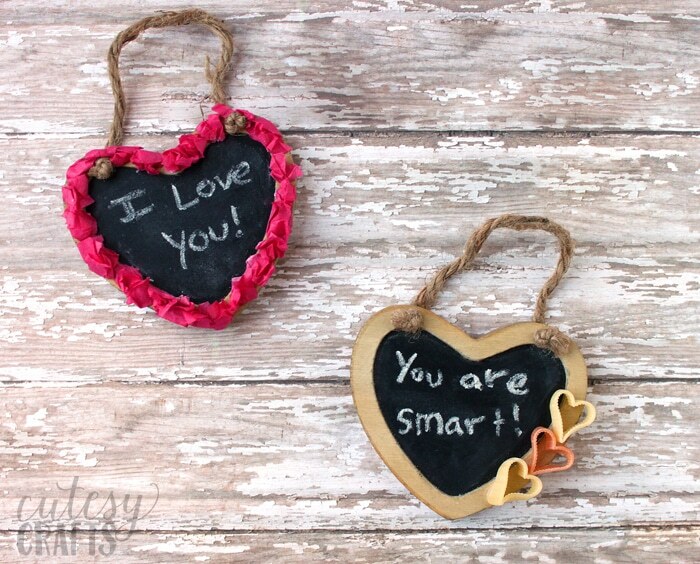 We made small chalkboard hearts too. These were perfect for the kids to make and can be hung on their door knobs to write messages on. The kids glued crumbled tissue paper squares or heart pasta on the small boards. These boards are good for writing small messages of love and would be great DIY Valentine’s Day gifts for the kids to hand out to parents or grandparents. Were you able to make it to one of the World Market events? They have them frequently, so make sure to follow them on Facebook so you don’t miss the next one.